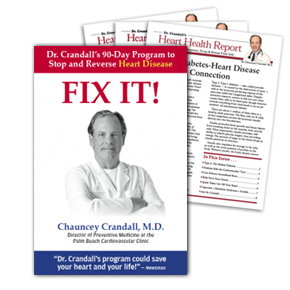 Just Give Dr. Crandall 90-Days, and He'll Show You How to Undo Decades of Damage to Your Heart! Dr. Crandall is living proof of his program's success. At the age of 48, and with no major risk factors, he found himself in the ER with a 'widow-maker' blockage of his main coronary artery. After emergency heart surgery, he recovered from heart disease using the same course of treatment he recommends to his thousands of patients — and details for your benefit in FIX IT! by 61% . . .